President Donald Trump invited some Senate Republicans to the White House on Wednesday afternoon for a two-hour conversation about trade. But the president couldn’t quite get the looming GOP rebuke of his national emergency declaration off his mind. “He would like for us to vote against the [resolution]. But he understands and respects that senators may have different opinions,” said Sen. Lamar Alexander (R-Tenn.), who has yet to announce his position but has repeatedly griped about the president’s end run around Congress. “There’s a border crisis and we have to deal with it. But I still have my constitutional concern,” he said. After more than two years of keeping his veto pen capped, Trump is going to have to put it to use — twice — courtesy of Republicans. In a remarkable bit of timing, the Senate will hold two votes this week placing GOP senators at odds with the president on foreign and domestic policy, likely forcing the first vetoes of his presidency. On the border resolution in particular, Trump has painted the vote as Republicans either standing with him on the border wall or supporting Democrats. But Senate Republicans claim the double-barreled veto fights, on legislation to curtail the U.S. role in Yemen’s civil war and block Trump’s national emergency declaration on the southern border, aren’t intended to be a personal condemnation of Trump. The White House has sent mixed and, at times, dueling messages about how it will handle an emboldened Republican Conference increasingly willing to defy the president. The president himself has told allies that he does not want to be “embarrassed” by a Senate vote on the national emergency resolution that garners over 60 votes and that he’s content to sign a veto on his signature campaign issue. And at the same time, he was making overtures to fence-sitting senators on Wednesday trying to pull them in his direction, including a midday call to Sen. Mike Lee (R-Utah) about his emergency reforms while Lee dined with his colleagues. Yet in that call the president said he would not support compromise emergency reform legislation that might have won over a number of conservative skeptics and prevented a big vote against him. Lee read the call out to a Senate GOP that suddenly saw few ways out of a vote whose implications are almost entirely political. Trump seemed resigned to the result in the Thursday meeting with senators, surprising several attendees with his laid-back demeanor. He made no political threats, they said. “He said that he wanted us to vote with him but understood if we didn’t,” a Republican senator said. It’s “extraordinary” to see Congress working to claw back power from the executive branch in a matter of days, said Sen. Rand Paul (R-Ky.), who will vote with Democrats and a handful of Republicans to form a bipartisan majority to try to handcuff Trump on both issues. But it’s hard to imagine a president who craves party loyalty will feel that way watching the Senate floor on Wednesday afternoon and Thursday as the votes occur. The Senate passed the Yemen resolution, which was a chance to denounce Trump’s lackluster response to Saudi Arabia‘s murder of journalist Jamal Khashoggi, with seven GOP votes on Wednesday. An even larger number of Republicans may stand against Trump on Thursday on the emergency declaration. Trump has worked hard in recent days to limit the GOP defections, but he essentially guaranteed he will have to veto the border resolution when he refused to support Lee’s effort to head off a GOP uprising against him. For Democrats who have seen no similar pushback from the GOP other than a handful of failed judicial nominations and the 2017 collapse of Obamacare repeal, there was some hope of a broader shift. If they could have avoided this week’s anti-Trump votes, Senate GOP leaders would have. But they can’t stop either resolution from coming up in the floor, under congressional rules. Worse still, both the border wall vote and Yemen resolution are at simple majorities, able to evade filibusters that would have prevented them from coming to the president’s desk. Several senators said privately they believed Trump wanted to fight with the GOP Congress, not cut a deal with them. The confluence of events put Lee, Paul and Sens. Susan Collins (R-Maine) and Lisa Murkowski (R-Alaska) in the position of voting against the president twice. The start-and-stop — and unsuccessful — efforts to woo Republican lawmakers into standing with the president demonstrate the increasing willingness of GOP lawmakers to push back on Trump and the limitations of a White House legislative affairs operation that has always had difficulty working in service of a president it cannot speak for. 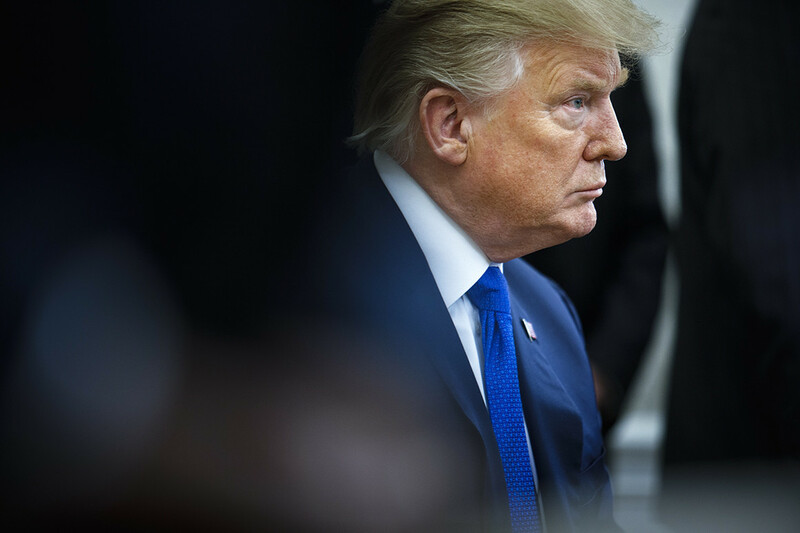 The confusion appeared to stem in part from internal disagreement among the president, his aides and Republican lawmakers about just how politically damaging the border wall would be for the president ahead of his 2020 reelection campaign. Some Trump allies said they believe a potential defeat in the Senate over the national emergency declaration is unlikely to cause lasting political damage to the president, particularly given that he was able to bounce back from a government shutdown over the same issue in December and January. More dangerous, said two former White House officials, was the president’s increasing openness to boosting legal immigration, a position that runs contrary to that of many immigration hawks. As the emergency vote approached Thursday, several senators were holding their cards close on the border vote even as it loomed just hours away. Sen. Pat Toomey (R-Pa.) said he’s “not talking about it right now.” Sen. Mitt Romney (R-Utah), whom Republicans believe is almost sure to vote against Trump, said he’s made a decision but hasn’t announced it yet. “Lots of things happen quickly in Washington particularly as you get close to the vote,” said Sen. Thom Tillis (R-N.C.), who wrote an op-ed late February saying he opposes the emergency declaration. Though about a dozen Republicans were thought to be in play to vote against Trump on the border as they weighed precedent and constitutionality, the bulk of the Senate GOP finds the week’s votes to be an easier call. Senior Republicans sought to play down the pivotal votes. They said it was unlikely to weaken Trump’s standing on the Hill even as they admitted Trump was paying close attention to his own party.